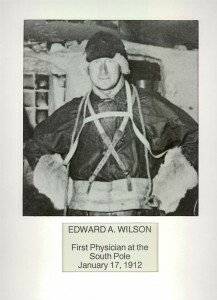 Bryan Lintott at SPRI (Scott Polar Research Institute, Cambridge, UK) and SPRI for providing images the 3 black and white images of Wilson in Antarctica, for this article. And of course, BBC News for commissioning me to write it. Doctor Dale Mole, my good friend and ‘fellow polar explorer’ who is currently the lone doctor overwintering at the US Scott Amundsen South Pole Antarctic Station. Photo taken by my friend, Dale Mole, the doctor at the South Pole. This Photo is taken of the picture that hangs in 'Club Med', the hospital at the US Scott Amundsen South Pole Station. It was famously described in Jerri Nielson's book 'icebound', and overlooks each patient and doctor who rotates through the hospital.